Less than two years ago Arturia surprised everyone with a drum machine that fused a thoroughly old-school analogue heart with a cutting-edge modern sequencing brain. 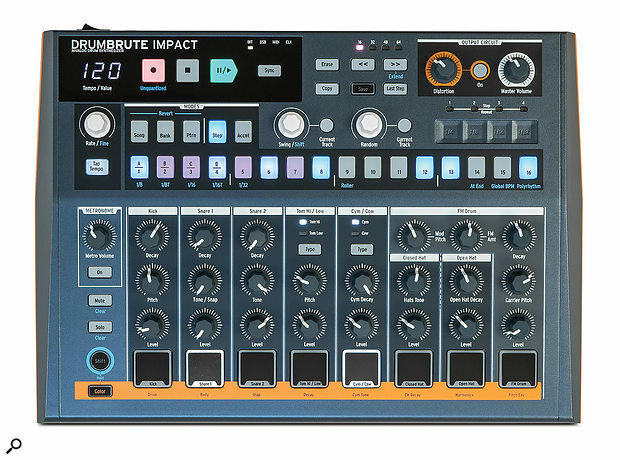 Now the DrumBrute faces some sibling rivalry in the shape of the DrumBrute Impact. Where the DrumBrute honoured drum machine royalty (ie. Roland) in terms of size and sound, Impact is a backpacking party animal. It’s Harry to the DrumBrute’s William. OK, I’m overreaching a bit to make the point that the Impact is not a cut-down version of the original DrumBrute... although in some senses it is. It’s a more compact, portable alternative, with a palette of sounds that has a family resemblance but a fiery new character. The core feature set is untouched, but some amenities have been stripped back: there are 10 voices instead of 17, fewer separate outputs, and no master filter. It does cost less, but not a lot less. 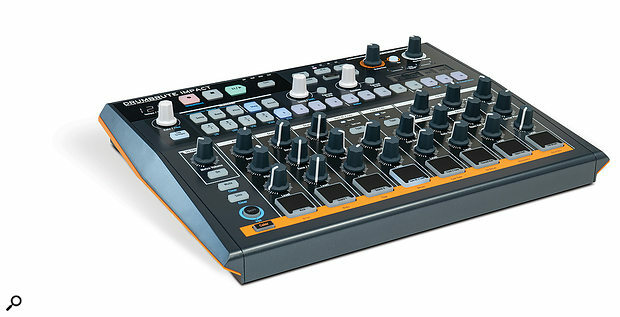 Street prices on pre-orders were around £75$150 below the original DrumBrute, ducking under the magical £300$300 mark. The DrumBrute Impact is 10 analogue drum voices and a BeatStep-style performance sequencer packed into a drum machine with the same footprint as my 15-inch laptop. 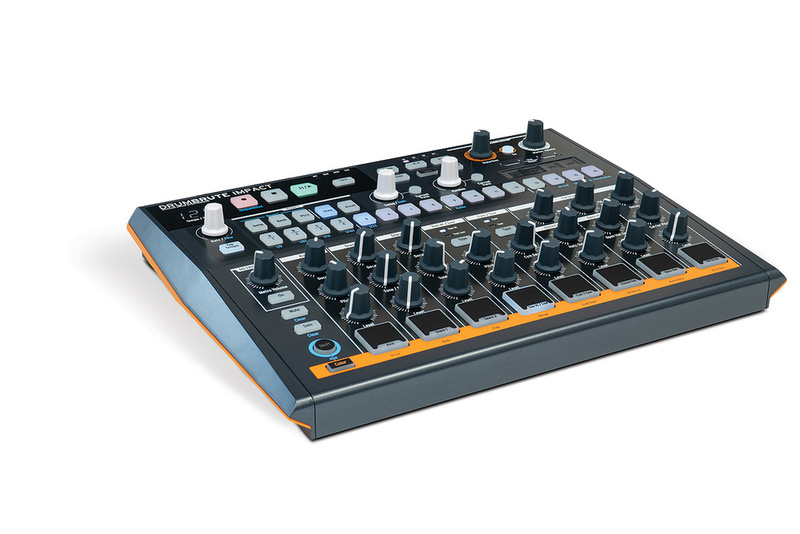 The first DrumBrute is a substantial desktop instrument; the Impact is more of a pick-up-and-go design. The 10 drum synth modules are controlled from eight panel strips and pads; Hi and Low Toms share controls, as do Cymbal and Cowbell. Yes, there’s a cowbell, unlike the regular DrumBrute. Sounds on the shared strips are still discrete voices and can be sequenced separately. The synth controls are always ‘live’: there’s no patch memory, motion sequencing or MIDI parameter control, so what you see is always what you get. The Pattern memory (four banks of 16 64-step sequences) stores sequences and sequencer settings that play back the sounds in their current panel state, exactly like an 808. Like the original, the Impact has a quarter-inch master mono mix out and a separate headphone feed, although this time it’s a single headphone output and it shares the main volume control. Four individual mini-jack ports are provided for splitting out some of the sounds. The Kick and FM Drum synths get their own channels, then the two snare sounds share an output, as do the hi-hats. Connecting any of these automatically removes that source sound from the main mix bus. While the number of discrete outs is significantly reduced compared to the big Brute, when you connect up the four provided it only leaves Cymbal, Cowbell, and Toms on the main out, so you get a reasonable amount of separation. Grown-up MIDI in and out ports are present, along with USB and Sync in and out. Sync of all kinds is especially well catered for. A dedicated button on the front panel lets you choose between Internal, MIDI, USB or Sync sources. I connected a MIDI cable from the Elektron Digitone I also had on test, toggled the Sync button to MIDI and the Impact immediately locked step with the Digitone’s transport and tempo. The Sync ports can talk in 1pps, 2ppqn (Korg Volca), and DIN24/48. All the sounds can be triggered from external MIDI, including the ‘Color’ variations that we’ll explore shortly. The USB connection handles MIDI communications and remote control/backup via Arturia’s standard MIDI Control Center software. There’s no USB audio interface or channel streaming functionality à la Roland’s Boutiques or Elektron’s Overbridge. The DrumBrute Impact’s back panel offers a quarter-inch main mix output and, all on 3.5mm jacks, a headphone port, four individual outs and clock I/O. Also present are a pair of full-size MIDI sockets and a USB port. Before getting into the details of the 10 drum synth modules, let’s talk about Color. This is a new feature unique to the Impact. As well as having editable synth parameters on the panel, each sound has a variant when it’s in ‘Color’ mode. You can latch a sound into Color mode indefinitely, or you can engage it on a per-step basis within each Pattern. To facilitate this, each sound has a second sequence layer for its Color state. The Color effect varies from sound to sound: it could be a drive boost, or different filter, pitch or decay settings. As well as Color, the Impact employs the tried-and-tested Accent concept, implemented the same as on the original DrumBrute. Sounds have two trigger levels (accented or not) and generally sound slightly different from one state to the other. As we’ll see later, Accent sequencing is handled differently to Color. First though, let’s run through the sounds. The Impact has a single Kick module where the DrumBrute has two, but don’t worry: the FM Drum channel can synthesize kicks that make the original two cower together in a corner. Those original kicks were along the lines of an 808 and 909. Impact’s Kick leans slightly toward the latter, but could stand in for either and has a kind of gnarly rumble to it. Ironically, the original’s Impact control on the kick is gone, as is control over sweep. It has a solid initial thump without being clicky, and the subtlest of sweeps that tracks the decay, which can vary from a short punch in the chest to a long floating hip-hop boom. Tonally, the variety available might not be huge, but everything it does certainly floats my boat. The Color variant is basically the same patch with overdrive added. Snare 1 sounds like it’s based on DrumBrute’s, but with the controls re-imagined. It’s 808-esque, with body tone and noise (snap) components. The original had granular control over the tones of the body and noise, as well as the decay and level of the latter. The Impact Snare circuit has fixed tones for the body and snap, a Decay knob which only affects the snap, and a Tone/Snap knob which crossfades between the two. Color mode pitches up the body tone. This is more limited overall but does mean you can almost make a pure noise sound. Which brings us onto Snare 2. This is a filtered noise source, with the filter swept by the Tone control. The Decay can go long, producing swooshes that are one of the defining character sounds of the whole instrument. In Color mode this module turns into a Clap, with brighter filtering and the classic analogue clap flam. The Accent variation is nice here, slowing the flam down and producing a smooth mellow clap. The Toms are fixed as short and punchy, with Hi and Low simply two different variations of the pitch, which is the only user-controllable parameter. Color lengthens the decay a touch and gives a little drive push. Cymbal is characterful, ringy and grungy with a rattly decay with an almost low-res digital character. It’s rather wonderful. You can control the decay manually, and lower the pitch with the Color effect. The Cymbal channel shares its trigger pad and level control with the Cowbell, which has no user-adjustable parameters. It’s a straightforward 808 cowbell, although it doesn’t quite capture the original’s exciting zing. The Hat channels appear to share the same synth as they are always choked and use the same Tone control, which sounds like it adjusts both filter frequency and resonance. They are bright and ringy, and range from sharp to mellow depending on the Tone and Color settings. The Open Hat gets its own Decay control. I can’t fault them, they’re what I’d be going for if I wanted to patch my own analogue hat sound. The FM Drum is the only module that uses the DrumBrute’s trick of stealing panel space from neighbouring channels. It also steals the show. It’s a simple two-operator FM synth patch with controls for the Carrier and Modulator pitches and the amount of FM. There’s also a Decay control. The Color mode adds a pitch envelope with a downward sweep that tracks the Decay time. This makes it the most versatile drum channel, capable of a variety of percussive plonks, tones, metallic zings and nasty industrial kicks. I was reminded of Korg’s ER-1, which is a good thing. Arturia’s BeatStep and KeyStep sequencers have become pretty much standard issue in hardware synth rigs, and the DrumBrutes get the technology built in. As far as I can tell, the sequencer is identical across both Brutes. Bank and Pattern are selected from the step trig buttons via specific modes. Pattern launching defaults to instant take-over, ie. the pattern changes instantly but maintains the same beat position. This is how I like it and is ideal for preparing and performing variations and fills. You can choose ‘At End’ behaviour if you prefer pattern changes to queue until the current pattern finishes playing. The DrumBrute Impact’s front panel measures 320 x 290mm, which seems positively bijou next to the original DrumBrute’s 418 x 276mm. As pointed out in the original review, you need to keep a check on which mode you’re in, and you’ll find yourself regularly jumping between Step (sequencing) mode and Pattern select modes. It would be nice if Arturia could adopt the Push/Machine/Launchpad convention, where if you hold instead of tap a mode selector the mode will jump back to its previous state after you’ve finished what you need to do and let go. Patterns can be captured as live recordings from the pads simply by engaging the record button in the transport area at the top. Live recordings align to the grid, based on the current pattern’s resolution (16ths by default), unless you toggle the Record button into Unquantised mode. The pads are velocity sensitive as far as MIDI output is concerned but the sounds themselves play at just two levels: Accented and non-Accented. Live Recording is clever enough to capture the sequence with Accents based on a velocity threshold. In Step mode you can create and edit patterns on the Step buttons using the TR convention; in fact you can do this at the same time as live recording. Regular triggers light blue, and Accented steps are shown as red. Slightly confusingly, to add Accents you switch to a dedicated Accent mode. From here you can create new Accented steps or convert regular trigs. But if you switch a step to Accented, then tap it again, it will remove that step entirely, rather than revert it. In other words Accent is a property of specific notes, rather than being a separate layer that modifies trigger events. The DrumBrutes provide quite a rich set of editing possibilities beyond basic pattern creation. For a start, you’re not confined to the grid. Swing can be applied to the whole pattern, or to specific tracks in varying amounts. You can hold any individual trigger and nudge it earlier or later with the Swing encoder, up to 50 percent of the way towards the previous or next step. This can be used for creating feel or off-signature timings, and is also useful for tightening up dodgy unquantised live recordings. A bit surprisingly, there’s no automatic post-hoc quantise feature. Step Repeats (‘ratchets’) can be added to existing gates using the same convention of holding the step button. While a step is held you’ll see its number of triggers light up on the Step Repeat LEDs above the Looper/Roller touchstrip. You can change this from the default 1, to 2, 3 or 4 by tapping the zones on the strip. Repeats are divided evenly into the sequence step, so a setting of three will produce a fast triplet. This is a great feature often overlooked by more expensive machines. Every sequencer or drum machine worth its salt these days needs independently adjustable track lengths. DrumBrute patterns start with a master length of 16 steps. This can be adjusted to any number of steps up to 64. There’s also an Extend function that will grow your pattern in chunks of 16 steps, duplicating anything you’ve already created. To change the length on a per-track basis you need to toggle on the Polyrhythms parameter. Thereafter you can use the Last Step button to specify where each track restarts. The result is a sequence tracks of different loop lengths or time-signatures that will phase against each other, creating variation and shifting polyrhythms. Finally, there’s a Song mode, which allows you to create a pattern chain and loop longer structures. It’s slightly more sophisticated than the temporary chaining available on some other drum machines in that you can save the Songs and view playback progress along the step buttons. I’d much prefer a song performance capture workflow like on the 808 though. The one thing about the sequencer that I didn’t get on well with was the workflow for copying Patterns. This requires hitting Copy, then the Pattern Mode button, then the source Pattern, then the destination. I generally like to be able to bash out pattern variations quickly while live recording. As it stands, copying Patterns is a bit of a flow killer, and on top of that you can’t change Patterns while in Record mode. On a hardware drum machine or beat station the number-one thing I look for is how quickly and fluidly I can mess with patterns to get variety, interest and a less rigid and repetitive feel. The DrumBrute Impact has a lot to offer in this regard. First, at the Sequencer level you have a Randomness control which, like Swing, can be applied to a whole pattern or in different amounts to different tracks. As you might guess, Randomness introduces random variation to your sequencer tracks, from subtle to frenetic depending on the amount you dial in. This is really effective and fairly natural-feeling: it modifies based on existing beats and never adds hits to tracks that you’ve not used in the Pattern. It’s a dynamic effect, applied at playback, and continuously changes, rather than destructively modifying your Pattern. A secret squirrel feature that can be activated via the MCC software is to allow the Randomiser to generate step repeats with a definable probability, much like the excellent Beat Repeat module in Ableton Live. Next up are the Looper and Roller features, both of which use the Step Repeat touchstrip, meaning only one is available at a time. The Roller is an MPC-style note-repeat feature that aids live playing or a quick way to add variation and fills over the top of a playing Pattern. You can also use the Roller during record, although repeats that run faster than the current Pattern resolution will be lost. So in a default Pattern, 32nd-note rolls will only be captured as 16ths. Regular note repeats added in the step sequencer can however exceed the Pattern resolution. I noticed that rolling notes don’t respond to pressure changes on the held pads — it would be nice if you could dynamically force accents while rolling. The Looper turns the touchstrip into a real-time beat repeater during playback, perfect for creating anything from short rhythmic variations, transitions and fills, to glitchy mayhem. Touching the strip loops the Pattern at the current playback position with a length based on the strip section. When you let go playback resumes in step with where it would have been if you hadn’t interrupted it. Perfect! Even better, while looping you can jump the loop to different points in the pattern with the step trig buttons. A nice touch (sorry) is that the strip generates and responds to MIDI, so you can automate Looper performances via your DAW or other CC-capable sequencer. Channel level controls are on pots, so bringing individual sounds in and out while jamming is less immediate than, say, the TR-8S with its track faders. That said, there are both Mute and Solo modes for cutting or isolating sounds. The Mute/Solo channel states persist in the background when you switch the modes on or off, effectively allowing you to quickly recall two different active track groups beyond the regular ‘all on’ state. However, as the Mute and Solo modes use the channel pads as switches, you can’t play sounds manually while either is engaged. As an alternative you can set the Mute/Solo modes to ‘latch’, in which case you can’t switch your Mute and Solo groups in and out, but you can leave them active and get pad control back. Considering that this is a 10-voice, true analogue drum synth rolled in with Arturia’s excellent sequencing engine, the DrumBrute Impact is incredibly good value. There are limitations compared to pricier machines, in particular the absence of any motion sequencing, modulation sources or MIDI parameter control. On the other hand there’s a strong set of manual, real-time performance possibilities. Like classic drum machines, there’s a particular set of sounds on offer, and there are fewer knobs to twiddle than on the original DrumBrute, but the Kick, Snares and FM Drum are surprisingly versatile. It’s not going to be for everyone, but for me the DrumBrute Impact ticks a lot of boxes and would be an easy choice to throw in the backpack with a couple of synths and a mixer. It’s a good compromise, offering true analogue drum sounds that I like, but with some of the convenience of modern digital devices. It’s great for jamming and writing sans DAW and the sequencer could easily be drafted to drive other MIDI devices. Give it a try. For alternative analogue drum machines with sequencing you might look at MFB’s Tanzmaus and Tanzbär. These don’t have the slick interface of the Impact, but do have motion sequencing, multi-step P-locking and LFOs. If you don’t mind going virtual analogue, then certainly add Roland’s Boutiques and TR-8S to your short list. As for choosing between the first DrumBrute and the Impact, the fairly modest difference in price probably makes budget a secondary consideration. Compare the sounds, and also think about whether portability or more individual outputs takes priority. DrumBrute Impact's MIDI Control Center software. DrumBrute Impact uses Arturia’s standard hardware control software, MIDI Control Center, for file management and access to advanced settings. This is where you back up or swap out Patterns in the Pattern memory, either as a whole or more selectively. A full memory dump takes a minute or two. The software also features a comprehensive Pattern editor, although this can’t be used to update the hardware sequencer in real time, so I’m not really sure what its value is. 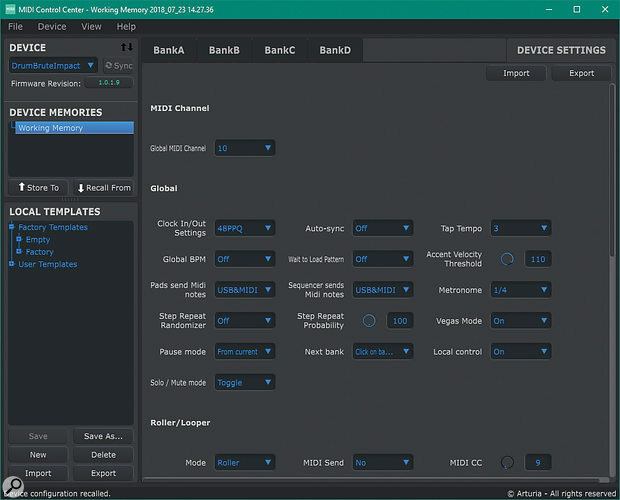 MCC has a panel for remote controlling all the Impact’s options and settings, including quite a few that can’t be reached from the hardware itself. This includes some operational preferences such as the Accent velocity threshold, metronome settings and the Mute/Solo mode behaviours. There are also system controls, allowing you to alter the MIDI Notes for each drum, set the MIDI channel, and decide which ports will output MIDI from the pads and/or sequencer. This all provides a lot of versatility while keeping the DrumBrute’s hardware panel mercifully simple and free of screens and menus. Quite a few commentators noted that the DrumBrute was a Brute without the ‘Brute Factor’. This is a distinctive feature of the various Brute synths, manifesting as a single knob that drives a feedback loop from the VCA back through the master filter, with some spectacular results. The DrumBrute had the filter but not the feedback. The Impact doesn’t actually have the filter; instead there’s a master Distortion effect. I did miss having the filter as a useful breakdown and transition tool, and the distortion is not so good for this as switching it in and out on the fly causes a big jump in level. However, the effect itself I really liked. Distortion and drive tend to be hit and miss, especially on drum machines. The DrumBrute Impact’s distortion is smooth and warm, producing a nice and punchy low-end saturation. Classic sounds with a tough edge. Color feature gives sequenceable sound variety. No motion sequencing/locking or modulation. Some sounds quite limited in range. Can’t switch Patterns while in live record. A classic analogue drum machine wrapped in a slick modern instrument, offering a fresh-sounding take on the core sounds of hard-edged electro, techno and hip-hop.